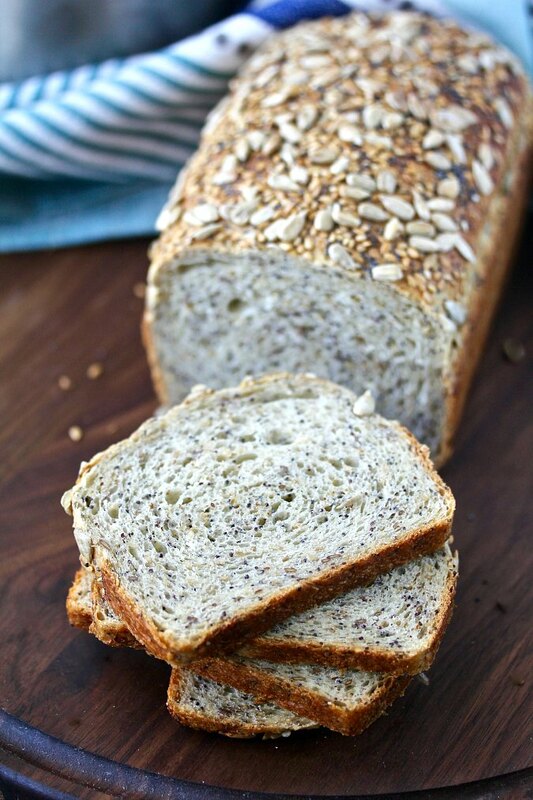 This multi-seed and grain honey bread is wonderful sliced and buttered straight from the oven. 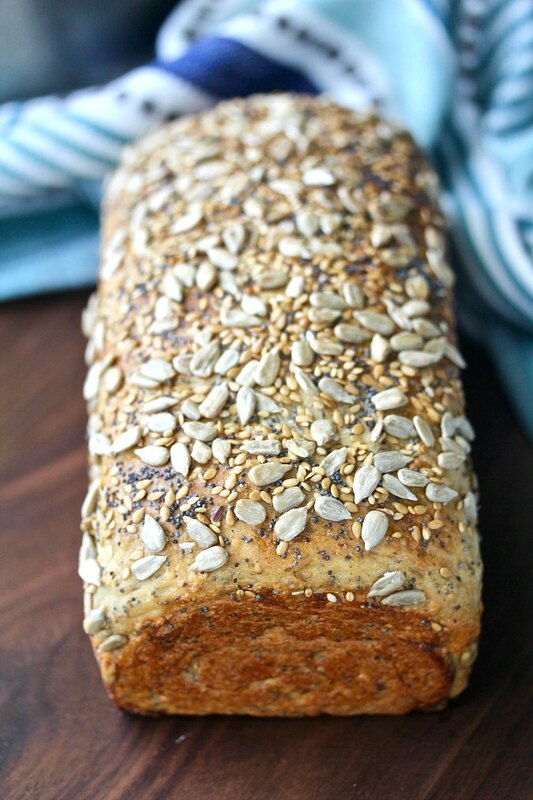 This bread is loaded with sesame seeds, flax seeds, poppy seeds, and sunflower seeds, along with rolled oats, honey, and bread flour. The seeds are both in the bread and on top of the bread. This bread is fabulous toasted and spread with butter. It's also wonderful thinly sliced and topped with this garlic and vegetable cream cheese spread or this smoked salmon spread. You could also thinly slice this bread, toast it, cut it into quarters, and serve it with salmon rillettes. 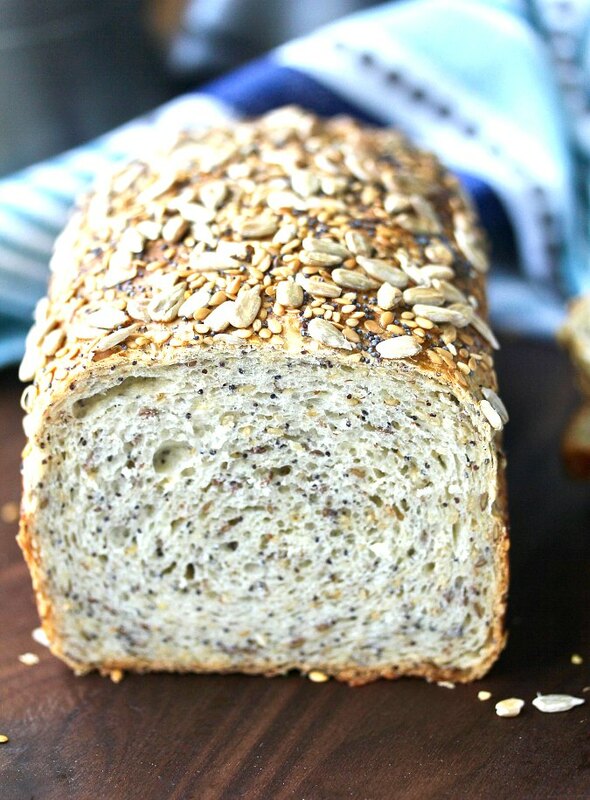 This bread was inspired by a recipe I found on the blog Fix Me a Little Lunch by Ali, my #FoodBloggerLove assignment. Once a year, Allison of the Pintertest Kitchen hosts this event so that food bloggers can show a little love to each other. Ali loves using local ingredients in her recipes and she loves shopping farmers' markets. She also reports that she loves baking bread. You know I gravitate to that! Before I talk about this bread, be sure to check out Ali on her blog, as well as Facebook, Pinterest, Instagram, and Twitter. I had fun rooting through my freezer to find all of the seeds I had hidden in there. I'm not surprised that I had everything called for in this recipe. My ingredient hoarding habit is a little out of control. P.S. Your freezer is your friend when it comes to storing nuts, seeds and whole grains. They can become rancid otherwise, unless you intend to use them quickly. Now, if I could just figure out how to manage my spice collection without having to worry about expiration dates! I used this recipe for Peter Reinhart's Struan bread for inspiration for baking times. I also tweaked Ali's seed ratio, eliminating some of the sesame seeds called for in the dough. It's been fun checking out Ali's blog. Be sure to check out her Recipe Index for lots of gorgeous recipes. Her cocktail index is amazing. After the recipe, be sure to check out the rest of the #FoodBloggerLove recipes. Mix all of the bread ingredients in the bowl of a stand mixer for about 10 minutes, until you have a cohesive dough. Alternatively, you can knead by hand. Form the dough into a ball, and place it into an oiled bowl. Cover and let rise until doubled. Heat the oven to 350 degrees F. and oil a 8 inch by 4 inch (or 8 1/2 inch by 4 1/2 inch) baking ban. Deflate the dough and form it into a log. Place the log into the pan. Let the loaf rise until doubled. Whisk together egg, water, and salt. Mix together the topping seeds. 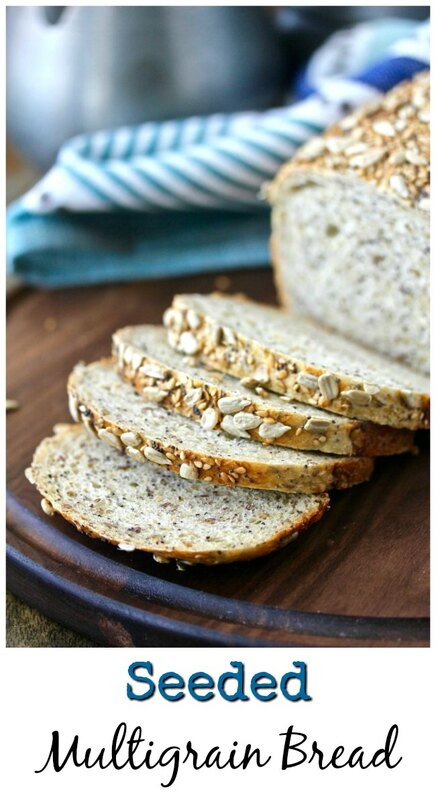 Brush the egg mixture over the loaf and sprinkle with the seed mixture. Bake the loaf in the oven for 35 to 45 minutes, until the loaf reaches an internal temperature of 185 degrees F.
Cool the loaf completely on a wire rack.